"Anterior superior alveolar branch" redirects here. For the artery, see anterior superior alveolar arteries. 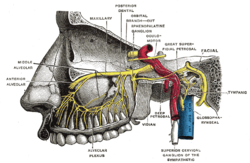 The anterior superior alveolar branch (anterior superior dental branch), of considerable size, is given off from the maxillary nerve (the second branch of the trigeminal nerve or cranial nerve V, abbreviated V2) just before its exit from the infraorbital foramen; it descends in a canal in the anterior wall of the maxillary sinus, and divides into branches which supply the incisor and canine teeth. 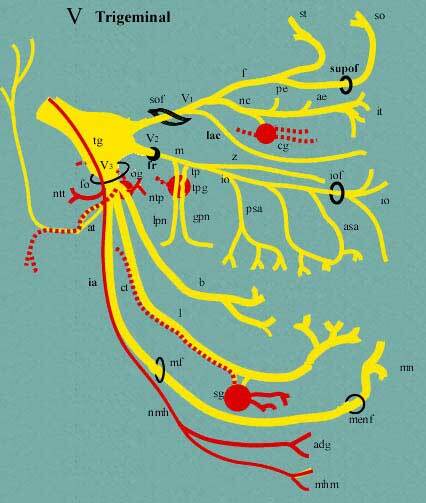 Alveolar branches of superior maxillary nerve and sphenopalatine ganglion. 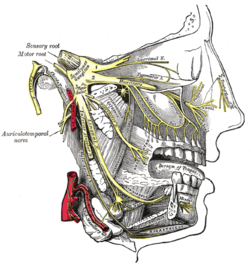 It communicates with the middle superior alveolar branch, and gives off a nasal branch, which passes through a minute canal in the lateral wall of the inferior meatus, and supplies the mucous membrane of the anterior part of the inferior meatus and the floor of the nasal cavity, communicating with the nasal branches from the sphenopalatine ganglion. Dental considerations for this nerve are important. The anterior superior alveolar usually innervates all anterior teeth, loops backwards to join the middle superior alveolar nerve to form the superior dental plexus. ^ Jones, Frederic Wood (July 1939). "The anterior superior alveolar nerve and vessels". Journal of Anatomy. 73: 583–591. PMID 17104781.